EXCELLENT DEVELOPMENT OPPORTUNITY!!! VACANT COMMERCIAL LAND AVAILABLE AND READY TO BUILD. 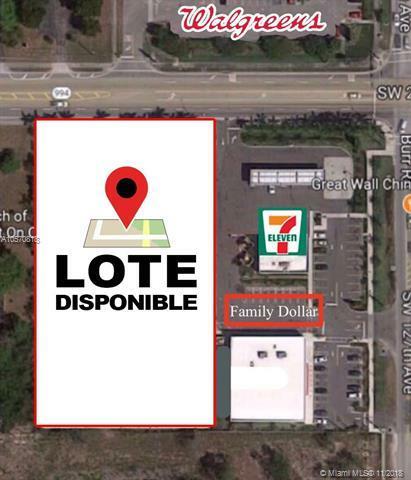 COMMERCIAL ZONED FOR SHOPPING CENTER. SURROUNDED BY LONG-TERM COMMERCIAL BUSINESSES, WELL LOCATED WITHIN A RESIDENTIAL COMMUNITY AND IN A VERY BUSY AREA IN MIAMI FLORIDA. PERFECT FOR INVESTORS AND DEVELOPERS.